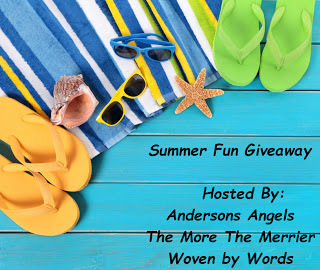 Andersons Angels, The More The Merrier, and Woven by Words are hosting the “Summer Fun!” Giveaway Hop from June 12th at 12:01 am EST thru June 28th at 11:59 pm EST! If you're a blogger, be sure to add your blog name to the linky below! The Summer Fun Giveaway Hop is free, but there will be a $25 prize minimum. Don't have a prize, who can't use a gift card, so that counts, too! Once your giveaway is live, please email the direct link to your post so that it can be added to the linky. Remember, if your post isn't up or correct, it's affecting the next person in the hop. DEADLINE : Sign ups close on June 8, 2016. Details will be emailed by June 10th or you can grab it in our Facebook Group anytime! If you have any questions about the event, we're available to help!